A key US space agency (Nasa) satellite important for detecting hurricanes and providing other climate data will go silent in the next few years, and missions to replace it have been cancelled or delayed. The QuickScat satellite, caught in a controversy that cost the director of the National Hurricane Center (NHC) his job, provides useful data on wind that helps weather forecasters detect major storms, such as the one that hit Japan this past week. The decision not to replace it will diminish forecasters' ability to predict some hurricanes and comes at a time when the need for climate data is paramount. While the instrument still works, the satellite that carries it has begun to show signs of age. Some of the sensors that provide orientation have failed and its transmitter is wearing out. "I can't imagine it's going to last three more years," said David Long, an engineer with QuickScat and director of the Brigham Young University Center for Remote Sensing. "And there's nothing else scheduled to go up," he said. The National Hurricane Center director, Bill Proenza, was forced to step down the week before last after criticising his bosses and suggesting that the loss of QuickScat would keep the NHC from doing its job effectively. He was called before Congress on Thursday to explain his position. Dr Proenza had angered his staff by failing to distinguish between the satellite's usefulness in tracking hurricanes in the open ocean and those close to shore. As hurricanes approach land, the NHC relies more on reconnaissance planes and radar. The NHC has said its ability to make accurate forecasts for hurricanes making landfall in the Atlantic and Caribbean will not be compromised when QuickScat fails. However, the satellite is more important for tracking hurricanes far offshore, beyond the reach of aircrews, in the tropical Atlantic and Pacific where the planes don't fly. The scatterometer aboard QuickScat helps detect changes in wind speed and direction that lead to the formation of a hurricane. Unlike ground-based instruments, it provides a global picture of the world's oceans. "Out here in the Western Pacific Ocean, I don't have an aircraft," said Roger Edson, a tropical meteorologist at the Noaa weather forecast office in Guam. 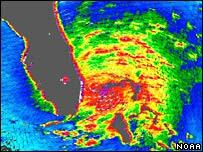 "Having satellite data from a scatterometer is an incredible advantage," he said. It is particularly useful for determining wind distribution throughout a storm's structure where speeds can vary by over 100km/h, Dr Edson added. Joe Sienkiewicz, a scientist at the Noaa Ocean Prediction Center, said QuickScat data complemented other sources to make forecasts over the North Atlantic and North Pacific, but that its high resolution and large coverage made it particularly good for short-term forecasting and for determining levels of threat. "It helps us distinguish the intense storms from the more routine storms," he said. Weather forecasters use other tools besides QuickScat to make forecasts, and said that when the satellite failed, they would rely on data from buoys, geostationary satellites, and a recently launched European satellite, AScat. But Dr Edson said the backup methods were not as accurate. The measurements taken by the scatterometer on AScat, for example, were farther apart and covered less territory. "The QuickScat scatterometer covers 90% of the Earth a day," he said. "AScat gives about half that coverage." Nasa scrapped a proposed mission to replace QuickScat in 2006. The Ocean Vector Winds (OVW) mission would have provided continuity with QuickScat, but was never funded. An updated version, the Extended OVW Mission (XOVWM), is listed as a priority mission and recommended for launch between 2013 and 2016, in a major study released this year by the National Research Council (NRC). But it does not have funding either. The NRC said the cancelled and delayed missions were due to federal cuts to Nasa and Noaa (National Oceanic & Atmospheric Administration) Earth science budgets. 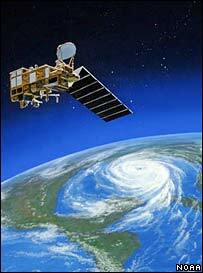 If the trend continued, by 2015 the US environmental satellite missions would be cut in half, the study warned. "This is happening at a time when the need for them has never been greater," said Richard Anthes, co-chairman of the committee that wrote the report. He testified before Congress about 2008 budget requests in June. 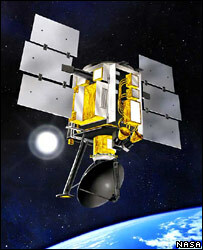 The National Polar-Operating Environmental Satellite System (NPoess), whose sensors have been hobbled and whose launch has been delayed until 2013, has been widely reported as a successor for QuickScat. But it does not have a scatterometer, and its proposed sensor, "will not do the job as well," said Timothy Liu, senior research scientist at the Jet Propulsion Laboratory (JPL), who worked on QuickScat and the proposed OVW mission. While Dr Anthes said bills recently passed by Congress that recommended boosts to the Nasa/Noaa budgets were a trend in the right direction, they fell well short of what the NRC had recommended for Earth science, and would not be enough to fly XOVWM. "It all comes down to politics and money," said Dr Liu, "and the long-term well-being of the Earth depends on these decisions." QuickScat has been valuable in weather forecasting; but it was originally designed to provide data on climate, said Dr Liu. Its sensor provides key information on sea ice coverage and wind circulation. Winds and ocean currents are the major drivers of heat between the tropics and the poles. "It's the coupling of the world's two great fluid systems that actively defines climate," said Michael Freilich, director of Nasa Earth Science Division and former project scientist on QuickScat. Such basic climate data is important to future forecasting. As the Earth heats up, as scientists expect it to, changing wind patterns will influence upper ocean currents, which in turn are likely to alter that heat transport system from equator to poles. Asked why Nasa is not flying all the missions recommended by the NRC, Dr Freilich said it came down to resources. "It's a matter of realism," he said. "Our job is to do the best we can with the resources we have." Congress is expected to vote on the legislation in September.